Whilst visiting the exhibition From Death to Death and Other Small Tales late last month I became intrigued by the sculptures of Robert Gober, which featured in the show. This is the main impetus for me writing this piece on his artwork. Within the context of that show Gober’s work appealed especially, as it seemed to me the most pertinent in relation to the exhibition’s overriding themes. Even more crucial to this, his structures had a visual ‘clout’, which lacked pretension - giving them a clear and direct overall relevance within the space they occupied. 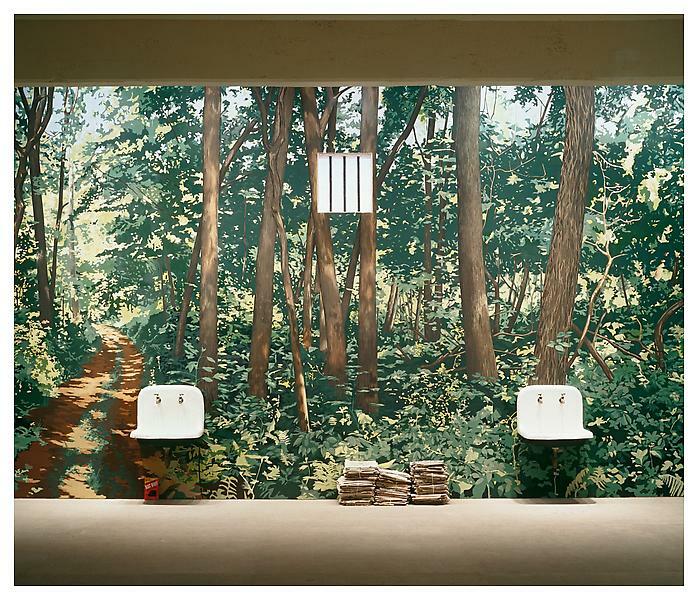 Robert Gober, born in Wallingford Connecticut in 1954, was recently described by Mary Schneider Enriquez, ‘Houghton Associate Curator of Modern and Contemporary Art’ at the Harvard Art Museums as “arguably the most important sculptor/artist of his generation”. After initially training as a painter and practicing in that field, Gober’s background and evident practical skills brought him to start working as a sculptor. Much of his ability as a tradesman came from his father. He had been a factory worker and a keen amateur craftsman (apparently building the family home himself) and encouraging Robert in this direction also. 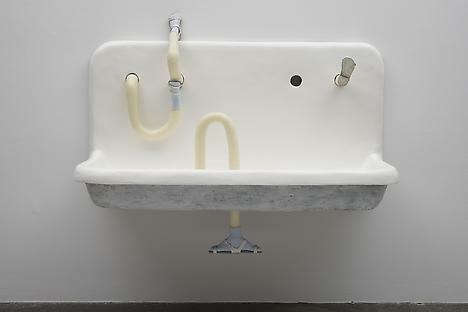 Therefore it would prove to be sculpture where Gober’s real ability and artistic vision lay. After focusing on this discipline in the mid 80s his reputation started to grow steadily. This would eventually culminate in a critically received exhibition at the Museum of Contemporary Art in Los Angeles in 1997; where he utilised the Geffen Contemporary space for an ambitious large-scale installation. And then in 2001 he was invited to represent the USA at the Venice Biennale. Gober’s sculptures contain elements which borrow from a whole variety of art historical sources such as Dada, Pop, the ‘surreal’; as well as adapting aspects of the minimalist aesthetic. Although ‘sampling’ themes and ideas contained within these different artistic approaches, Gober has never become too much of any one specifically. Instead, by using a variety of sources - and coupled with a genuine dedication to serve his own means - he has constructed a largely individualised ‘appearance’ for his work. One way that he has been able to do this is by sculpting - or casting - and also using very specific objects in his work. He has become known for his casts of body parts (primarily from his own body) i.e. legs and torsos, and for adapting certain everyday objects like sinks, doors, chairs, children’s cots – to mention but a few. His sculptures and the meanings they are able to convey through context, distortion and appropriation, has helped give Gober’s work recognisable features and forms. He presents these sculptures in a very specific way, often creating large scale room installations and by using staged lighting and features like running water. Some specific pieces which I have sited as being of particular interest to me are: his works Untitled 1995 – 1997, a mixed installation piece where the central Madonna figure has had a large circular, hollow pipe put through her waist (or perhaps more fittingly her womb); his various ‘Crib’ pieces where he has brilliantly and subtly ‘altered’ the child’s playpen or cot structure; and his use of sinks, specifically Untitled 1999-2010, a piece where children’s legs are protruding from the object, appearing to take the place of it’s associated ‘plumbing works’. The themes that occur in Gober’s work navigate around sexuality/gender, religion and memory; with the notion of ‘childhood’ being at the centre of such memories. Being openly Gay and having had a Catholic upbringing, Gober’s use of iconography and symbolic signifiers in his work often conveys a dichotomy which directly references certain polarised positions relating to these individual origins. Another feature of his work is that of water. These are connected with the use of sinks. The notion of cleaning and cleansing the body and the soul – in the religious sense – has been sited as a comment on the Aids epidemic; especially in its inception. The initial misunderstanding and lack of knowledge of the condition – culminating in discriminations towards Gay men because of this - intensified when the disease first became evident. Gober has used many of these issues as a creative source for his art. His use of water has been employed as a way of commenting on and playing off against, the idea of ‘Holy Water’ and that of a ritual religious purification. Imagery relating to childhood is another interesting aspect of his work. The use of the crib and that of the child’s legs and feet, are the most obvious reference in this regard. In what is often a kind of subtly nightmarish, ‘Lynchian’ metaphor, the child has escaped from the stereotypical cot or playpen. For example, in specific works the playpen is only a three sided structure or has been completely distorted in someway - slanted in one direction for instance. And, in one of his most complete, clever and powerful pieces - the cot has been turned into an ‘X’ shape. The distressing nature of this is clear in my view; as the notion of ‘X Crib’, in a sense is turned into the natural home for ‘Child X’. What makes Robert Gober’s art so compelling is that he manages to continually create works which are relevant to the times we live in. I tend to agree with Mary Schneider Enriquez’s earlier statement, as I can think of few contemporary artists who have made work which is so obviously applicable to the times they have been working through -being the late 20th and early 21st centuries. Even in his more subtle statements, Gober’s art still deals directly, and extremely powerfully, with some of the major social issues that the (Western centred) world has faced in recent decades. Although the realm for much of his work often comes from very personal origins, he still conveys universals humanist based subject matters. I recently read one article that described the ‘ambiguity’ in Gober’s art. In reality I feel this couldn’t be further from the truth. Although often allowing for a certain amount of interpretation, his art clearly deals with very specific subject matters. I believe the impact of his imagery is made even stronger because when you experience it you fundamentally understand what he is “getting at” (as it were). For me this recognisable clarity and purpose is the real power of his work. After gaining a greater understanding of Gober and his work I can understand why he has been so highly regarded in contemporary art circles. I think his works’ appeal and his overall reputation is certain to grow further, as he clearly understands the power of communicating ‘real’ implicit human emotions. In a world full of opaque, overly personal and convoluted statements, Gober’s highly individual and clever - yet directly ‘legible’ artworks - have a particular importance because of their relevance and greater level of intrigue.